I think this has to be one of the most enjoyable projects that I’ve done so far. If you’ve read my blog for any length of time you know that I absolutely love Annie Sloan Chalk Paint® (and I don’t get paid to say that). I have painted wood furniture. I’ve painted glass. I’ve painted hardware. I’ve painted lamps. I’ve painted metal. But, fabric? Really!? This, I had to try. 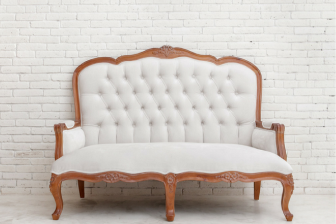 I had been looking for a smaller sitting solution for our living room and came across this vintage settee. The seller was a cute gal who had just moved into an old row house. Unfortunately, it didn’t fit in her new layout. Her asking price said I just want it gone… and I was happy to take it off of her hands! I couldn’t believe how lucky I was. The bones of this piece were fabulous! The frame was sturdy. The springs were perfect and even the upholstery was newer… just not my style. Okay who are we kidding… who’s style would this be? I love it when you can create the look of an expensive piece of furniture for very little money. Painting allows you to do just that. I’m not going to lie. I sat on this piece for a little while. Both literally and not literally because I couldn’t decide what color to paint her. Mix 2 parts Antibes Green, 1 part Florence and 1 part Aubusson Blue to get this rich emerald green chalk paint® color. Add a little water to the paint and mix it up really good. I didn't want the paint to sit on the fabric, I wanted it to soak right in. Apply one light coat of your slightly water downed chalk paint® to your fabric. Use your water spray bottle to dampen the fabric just slightly before you paint. This helps spread the paint easier as well as helps the paint to soak into the fabric. The first coat looks like crud. ;) Hold on tight! The second coat gets better! (Wait 24 hours and make sure that the fabric is dry before painting a second coat.) While waiting for the upholstery fabric to dry, I used this small paint brush and painted the settee frame in Annie Sloan Chalk Paint® in Graphite. I didn't tape off my edges. These small paint brushes are the perfect size for painting the edges and getting into tight spots! Once both coats are dry, apply clear wax with an old T-shirt to the fabric to seal it. The settee frame was sealed with a mixture of of dark and clear wax. UPDATE! : Some of you have asked me how the paint holds up on fabric. I'm happy to report that as of Fall 2016, our settee is still going strong! It looks almost as good as the day I painted it... Three years later! If you enjoyed this painted upholstery tutorial, you might also like this painted chair makeover! 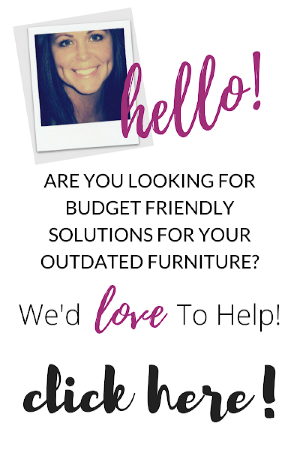 Would you like to learn more about refinishing furniture? 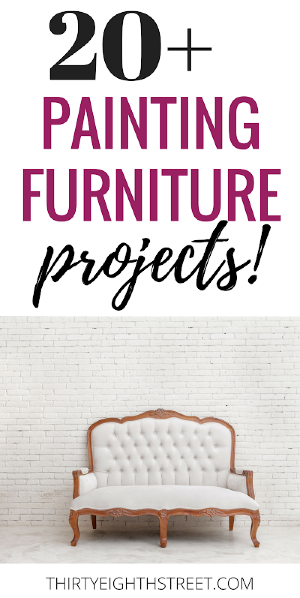 Stop by and check out our Furniture Painting & Tutorials Resource Guide! What did you do to "wax" the fabric - never heard of that. I rubbed Annie Sloan Clear Wax into the upholstery with an old clean/soft t-shirt. How has this piece held up over the past year? I'm thinking about trying this on a couch we use all the time but I'm still just a smidgen skeptical. Everything in my body says "don't paint the couch!" lol! This settee doesn't sit in our TV room. So we aren't laying on it and lounging around. But it does get sat in 2-3 times a week with multiple people on it. I have two boys and it's been through them and a move in the past year and it looks just as good as when I painted it- I've been pleasantly surprised! Before I painted it, I just thought to myself that if got a little ding or stain here and there, I could just easily do a quick touch up paint to fix it... and it would still be cheaper then getting it dry cleaned! :) Good luck on your fun project! Really nice makeover, That green really pops! Great project, I'm glad it pasted the bum bum test. I have never thought to use wax on fabric, interesting idea! We are so excited that you linked up to Merry Monday this week! Sharing your post today on my FB Page. Come back next Monday for another great party share! Party opens Sunday night! Have a great week! Thanks for stopping by and for sharing this project! We'll see you again at Merry Monday! I always am curious how painting upholstery turns out in real life... you couch looks gorgeous! 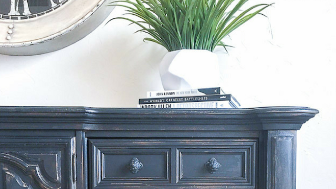 Such a great way to re-purpose a piece of furniture without having to completely take it apart and re-do it! Plus I'm loving the color scheme for the room re-do... those white and grey chairs look delicious! Thanks for linking up with us at the Welcome Home Wednesday Link Party this week... I'm featuring your post in my weekly round-up... it will go live tomorrow (Saturday) morning! I love this! I have been wondering how to paint fabric so it wasn't hard and uncomfortable, this is perfect! And I love the green. 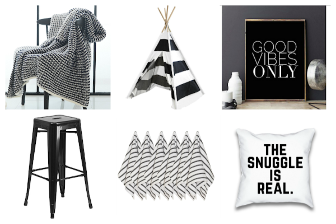 Your style is similar to mine, I love seeing what you are up to! So fun. What a great find of that settee. And it's final look is gorgeous! I've been researching painting fabric for months and I'm still not brave enough to do this but boy, your project is inspiring me. That's the sincerest form of flattery! Thanks, Ann! Jenna! Yes, the fabric does make a difference! Looking forward to partying again! Thanks! Absolutely stunning. I LOVE green furniture and I just adore that you did it yourself... amazing! I'm in the LOVE GREEN club too. :) I appreciate you taking the time to leave such a nice compliment! Thanks, Christine! I'm honored, Kammy... thank you! Good Morning Carrie!! Just popping in to let you know your post has been picked as a feature at the Welcome Home Wednesday Link Party! Stop by this morning to see your feature and link up! Don't forget to grab your "Featured Button" too! This is impressive! I love Annie Sloan chalk paint, but I haven't been brave enough to try it on upholstery. Thanks for sharing on Snickerdoodle Sunday. Pinned and Tweeted. It's great to know that it's holding up well. 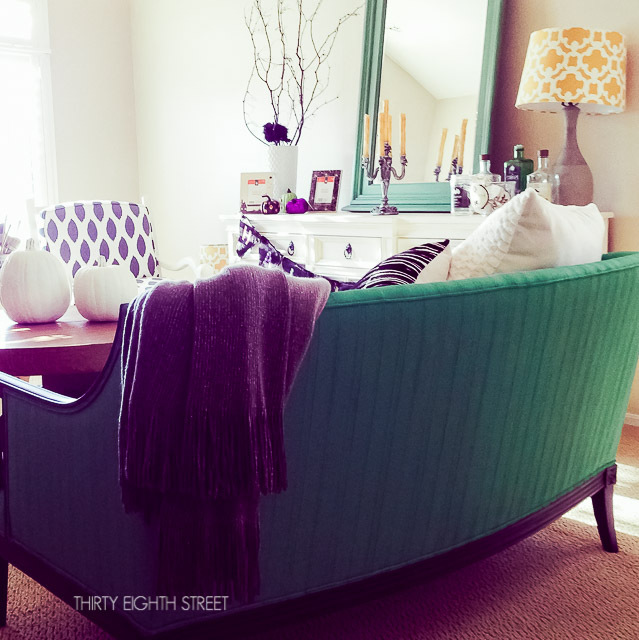 Although a green couch is too bold for my living room, this is so pretty! Thanks for sharing this with us at Talented Tuesday Link Party last week, hope you join us again! That green looks really classy! Thanks for sharing at Home Sweet Home! Great transformation Carrie and I love the colour. 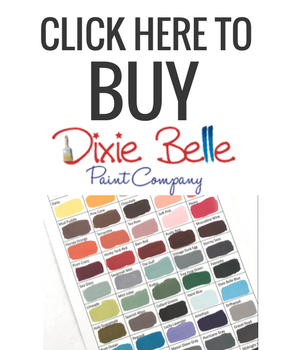 Annie Sloan Chalk Paint is amazing! Thanks for linking up at Shabbilicious Friday. I'm delighted to be featuring your settee at tomorrow's party. Wow! I'm honored. Thank you for sharing it, Kerryanne! I have wanted to try this and now I just have to! Love it! 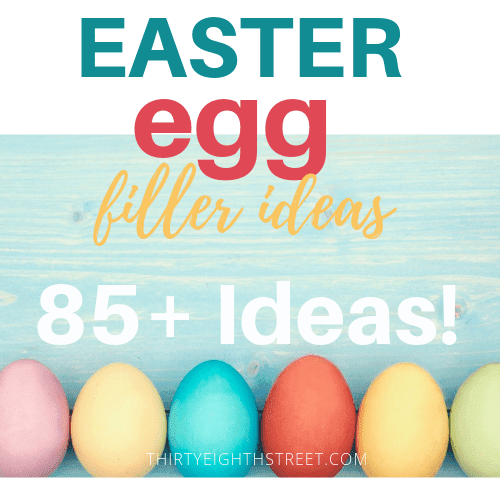 Sharing tonight on The Painted Drawer Link Party! Thanks for linking up! Suzanne! 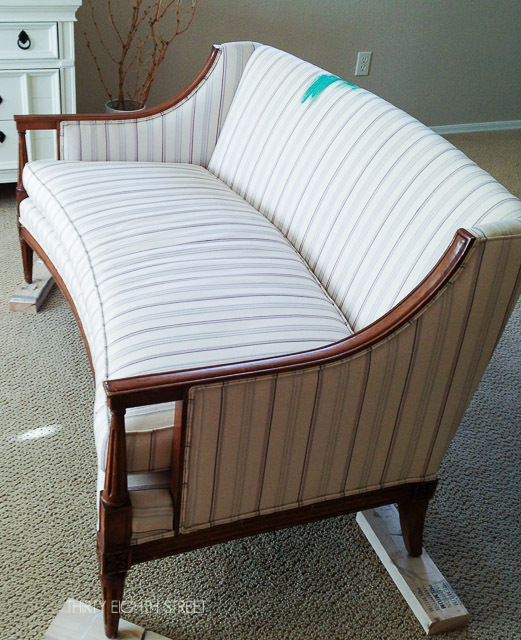 If you've decided to paint upholstery because you saw this project then that is the most sincere form of flattery! Thanks so much for sharing our work! Your settee looks amazing! Love the style and the new color. And the whole room is a knock-out! Featured at Be Inspired this morning. Thanks so much for sharing! Hi, they say great minds think alike--I just chalk painted a sofa too! Saw your feature at Be Inspired and had to stop by. This was my first experience painting upholstery and I am just thrilled with the results! Love your transformation! What type of brush did you use or did you use a roller, etc? Love it !!!! Hi Linda! I used a 2" Purdy paint brush for this project. I have a deep red couch and would like to go turquoise. Should I start with white and then go to chosen color or just more coats? Thanks, I loved this makeover soo much. Save your white paint for something else! I would do the extra coats of turquoise. I'd love to see it when you're all finished! I'm wondering about whether this painting technique will work on a lounge chair surface that has been 'rubbed' smooth from body oils. You know, where the head rests. Is it worth trying? It's been professionally cleaned but still looks pretty cruddy. Great question! I'm not sure I know the answer. If you hate the way it looks now, it might be worth a shot!